Playing for long hours under sun, or walking under scorching heat, is enough to drain energy out from your body. You feel tired, and thirsty. 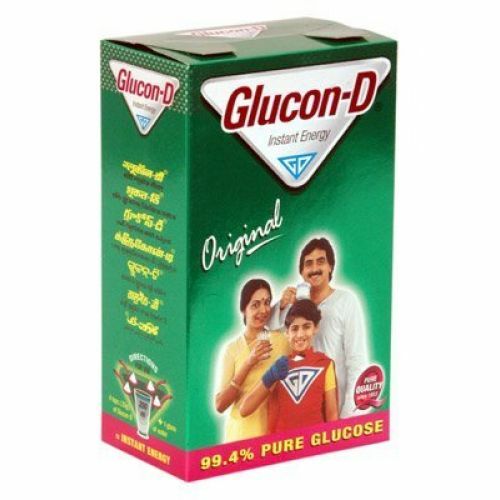 Substitute plain water with Dabur Glucon-D, an energy drink for all ages. It helps in jump starting your day by filling you with excessive energy. It is a perfect compilation of Calcium and Vitamin D, which helps in easy assimilation and quick replenishment. A quick drink of this energy supplement will instantly charge your body with essential minerals, vitamins and body salts. Copyright © 2017 - 2019 Clear Tech LLC. All rights reserved. Tell us your shipping zip code so we can show you accurate inventory in your area! We ship to addresses in Alaska, Hawaii and Puerto Rico too!